Unnoticed by America’s wine-focused media, a recent episode of the popular RAI-produced news show “Report” entitled “Prosecco Village” portrayed Prosecco growers and bottlers as greedy entrepreneurs who have exploited the wine’s popularity at the expense of residents of the Veneto and Friuli-Venezia Giulia. Aggressive spraying of vineyards, claim the show’s producers, have led to higher levels of cancer and other illnesses among people who live there. “Report” is known for its controversial and often sensationlistic coverage. (Its show devoted to “cancer-causing” wood-fired ovens in artisanal pizzerias in Naples was a recent example of its over-the-top approach to Italy’s food industry.) 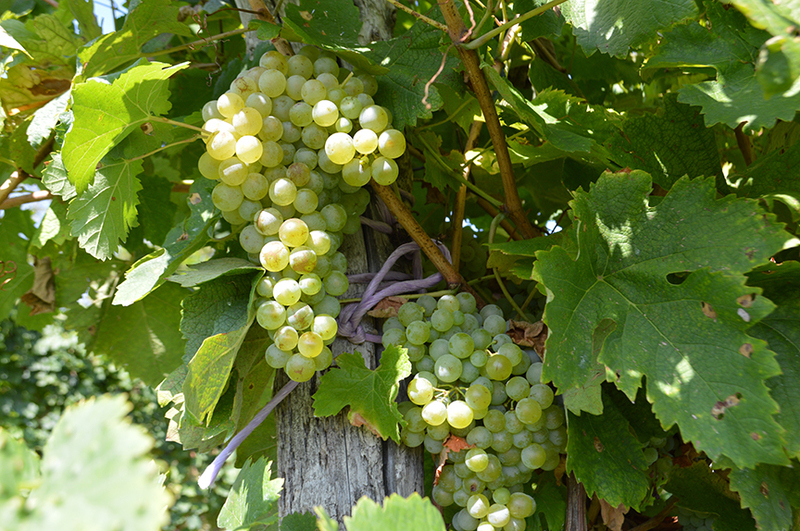 The episode created quite a stir in the Italian wine world, with many pundits and artisanal winemakers defending the Prosecco growers. For Italian readers, in case you missed it, see this post by my friend and colleague Alessandro Morichetti for Intravino. Today, I translated the following op-ed by my client (and friend) Luca Ferraro, a certified organic grower in the Asolo Prosecco DOCG and one of the winemakers I admire most for his honesty and earnestness. Have you noticed? Recently, it seems that giving Prosecco a bad name has become an international trend. Everyone needs to spend at least five minutes of her/his time explaining the reasons behind the phenomenon of the most widely sold Italian sparkling wine in the world. And if possible, they have to give the story a negative spin. It seems that our planet is suddenly full of brilliant people who want to become presidents and directors of grape grower consortiums. The attacks arrive from every corner: Sensationalist TV programs, environmentalists, winemakers from other appellations, each with their own score to settle. Prosecco is on an express train. People like it. Everyone can appreciate it. It’s easy to understand. It can be served for nearly every occasion. Excuse the expression but a lot of people are pissed off that such a simple wine has claimed such a large slice of the market. Today, I’d like to address the “environmentalist branch.” But first I’d like you note the following figures. Despite the wide area where Prosecco is produced in its various expressions, critics have focused on the hills of Conegliano and Valdobbiadene. In those townships, the density of vineyard plantings is certainly higher. But it’s this very characteristic that has made the landscape there so compelling. Over the course of the decades since the Second World War, wise and able farmers have shaped its beauty like they were new Canovas, lovers of their appellation and the places where they make their homes. The beauty of these places has prompted a growing number of people to settle there. They come seeking the peaceful and enchanting countryside and they want to be in contact with nature. But this can lead to problems when the townships allow people to build homes among the vines, often refurbishing old barns. They don’t stop to consider that these same persons can decide, from one day to the next, that you, a grape grower, who has always lived there, can no longer spray your vineyards because it might bother them. I’m certainly not here to claim that there haven’t been problems when farming and humans live together. There are still problems today. But journalists often decide to foment fear by claiming that our area is a sure-fire source of tumors and other grave illnesses. They claim that our vines cause landslides and flashfloods. They present grape growers as if they were exterminators. And when they do so not to engage in earnest and well-documented journalism but merely in order to raise their number of shares and clicks, I need to share my two cents. Local government officials in Treviso have created a roundtable to understand the problems in Prosecco today. I’ve been fortunate enough to participate in the gatherings as a member of FIVI, the Italian Federation of Independent Grape Growers. 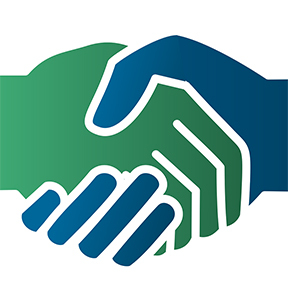 Other participants include town mayors, consortiums, environmentalists, citizens, and other professionals. We have spoken to researchers who study disease data and they tell us that the incidence of tumors is lower than in the rest of the Veneto region and it aligns with national levels. We have spoken to Italian Forest and Wildlife Rangers who inform us that that the number of forest fires is lower because there is less fallow land. We have discovered that it’s thanks to grape growers who manage “green” areas that there are fewer landslides and flashfloods, catastrophes that are caused by blight and overdevelopment. Nobody ever talks about the efforts by the consortiums to study and create protocols that limit the use of chemicals to treat vine disease. Nobody ever talks about how farmers are constantly trying to follow the consortiums’ recommendations and guidelines in order to better manage the vines. Over the last 15 years, the use of chemicals in the vineyards has consistently decreased. Nobody ever talks about how there is a new generation of grape growers, with attitudes very different than 40 years ago. They work together to study, to research, and to tackles problems in the vineyards with the best possible results in every given vintage. Nobody talks about the townships’ aggressive regulation of our work, something that we must rightly adhere to. Nobody talks about how the water table in the Veneto region has a bill of health that puts it far under the threshold for risk. That’s because the Veneto region has one of the most aggressive protocols in Italy for the collection of data, the number of sites monitored, and the number of substance monitored. And all of this was in place long before the TV cameras arrived. We can always improve in our work and in our lives. And it’s our duty to work together to make the hills of the Prosecco DOCG a beautiful and healthy place. It’s party of what we do for a living. Can you think of a quality producer of wines who isn’t interested in making her/his workplace healthy and beautiful to behold? How could we grape growers deface our true master in our lives and our work? One thing that we often forget to say, as if it were an insignificant thing, is that grape growers are the first and foremost to “live” their appellation. We were born here and we live here. And this is our home. The Do Bianchi Holiday Six-Pack is here. Thanks for your support and happy holidays! 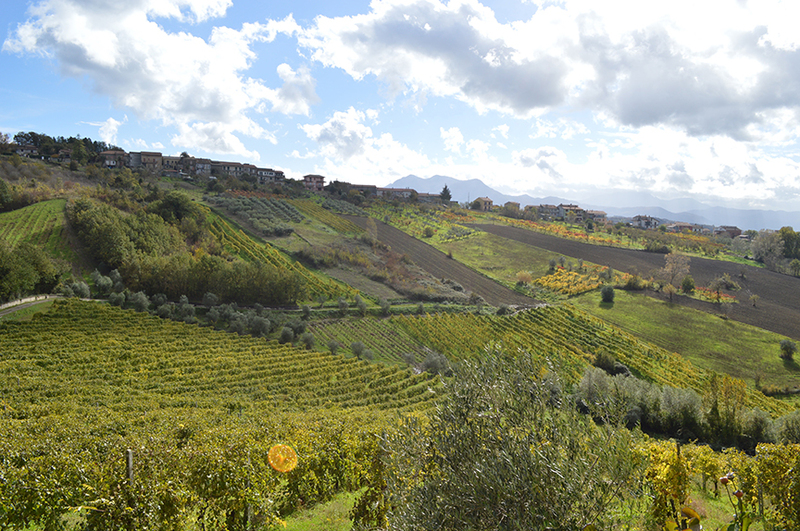 The land of Irpinia (Campania, southern Italy, near Naples) is as wild as it is delicious. Please place your order before Wednesday at noon PST. Order simply by emailing me here. 10% discount applied if you buy two or more. It’s been a busy year for me traveling to Italy (9 trips this year!) and traveling across the country leading Franciacorta wine tastings for wine professionals, writers, and consumers. One of my biggest revelations was my first trip to Irpinia (in Campania), which I made in early November of this year. Until I actually headed up the mountains from Naples and visit Taurasi and Avellino, I really didn’t understand how “heroic” these wines are. I knew they were great. And we’ve been serving wonderful Taurasi, Greco di Tufo, and Fiano d’Avellino at Sotto (the restaurant in LA where I co-author the wine list) since it opened more than five years ago. But when I traveled there and discovered what a desolate yet beautiful place it is, I realized that I really hadn’t wrapped my mind around how special they are. Aside from an old-school restaurant or two, a handful of pizzerias, and maybe one or two “destination” restaurants, there really isn’t much up in those volcanic mountains beyond wine and grape growing. It’s an extremely depressed part of Italy where relief from the financial crisis is still far off on the horizon. It’s also one of the most “extremely” beautiful parts of Italy I’ve ever visited: in part because it is so underdeveloped. We’ve all drunk these wines in super hip restaurants in NYC and LA and some of us have even drunk them in Naples. But to go see where they are raised and to meet some of the people who make them was as inspirational as it was eye-opening. If you’ve ever read Pasolini’s essay about life in Naples, you’ve had a taste — just a taste, mind you — of how these places are so unique in the panorama of Italian viticulture today and over the millennia. The 2016 Christmas six-pack includes the 2015 Fiano d’Avellino from Struzziero, a hard-scrabble winemaker who makes extraordinary wines imho. The other big jaw-dropper in this flight is the 2011 Barolo by Ballarin, one of those under-the-radar producers that I discovered last year. I tasted with the winemaker in July in Barolo village and was so impressed by his wines that I had hoped to offer his Anascetta in this flight. But sadly, it was sold out. Ballarin’s Barolo is old-school, all the way, the way I like it. (As my buddy at Chambers St. Wines like to say, I like big botti! In other words, big, ahem, barrels.). Like all my offerings, this one is flight up like a dinner party. Serve in the order I recommend and you will move up in body until you get to the biggest and boldest of the wines, the Barolo. Then the Moscato is a dulcis in fundo wine to serve at the end with fresh fruit (ideally). It will serve 6-8 people depending on the crowd. And of course, all of the wines are great on their own as well. Just remember to always serve with food in accordance with the Italian culinary maxim: no wine without food, no food without wine. Thanks so much for your support and happy holidays! Old-school Prosecco the way the nonno made it except for cleaner and more focused. Serve “clear” by decanting the sediment (by storing upright in your fridge overnight) or serve cloudy (the way we do it) by gently inverting the bottle before you pour. See my notes about. I LOVE the fresh, fruit-driven nose on this wine. Bright and fresh and pink. Salty with good fruit. This is one of those electric wines, with really vibrant fruit on the nose and in the mouth. It’s definitely a “wow” wine. See my notes above. This wine can also be cellared with great results and makes for an awesome gift. Serve with fresh fruit at the end of a meal or serve with brunch (this is around 7 percent alcohol so it’s a perfect breakfast wine or Christmas morning wine). The closest Starbucks to my in-laws’ house in Orange, Texas is nearly 22 miles away, roughly 30 minutes by car. I was there early on Thanksgiving Day using the Google-powered internet and working quietly on a project that I’m trying to finish before year’s end. Over the 3 hours I was there (from about 7 a.m. to 10 a.m., more or less), I saw Asian kids, black kids, Mexican kids, white kids, and even a table of camouflage-wearing middle-aged white people, women and men, who spoke very loudly of their approval of Donald Trump and the new direction he’s taking our country. 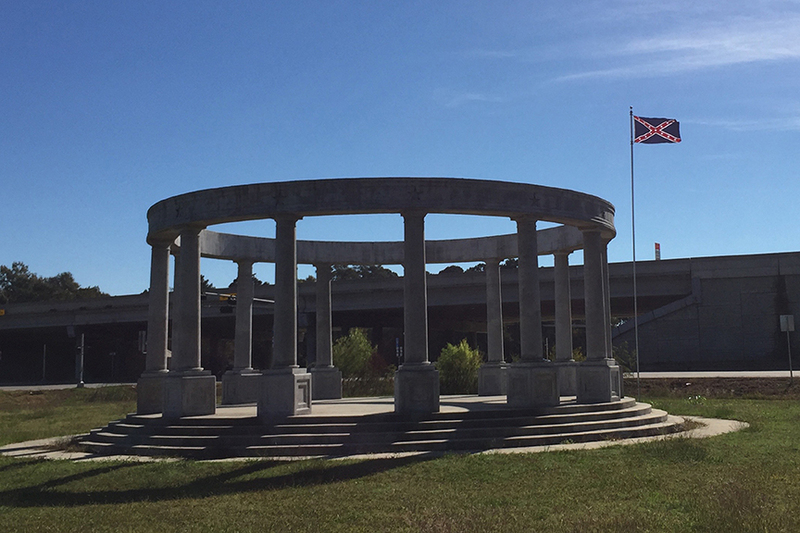 Taking the long way back to Orange, which lies on the Louisiana border, I made a detour to visit the Sons of the Confederate Veterans “Memorial of the Wind,” which is located on Martin Luther King, Jr. Dr. where it intersects Interstate 10 (in the photo above). When you exit the eastbound freeway, before you travel beneath the underpass to get to the north side of the road where the memorial is located, you see the billboard below. It “welcomes” visitors to Orange, home of the West Orange Stark High School football team. Martin Luther King, Jr. Dr. is one of the city’s main thoroughfares and so it’s only natural that the exit is well-trafficked. A year of a lot of high highs and low lows, moments of great joy and moments of deep-reaching soul searching as we try to figure out how the world is changing around us. 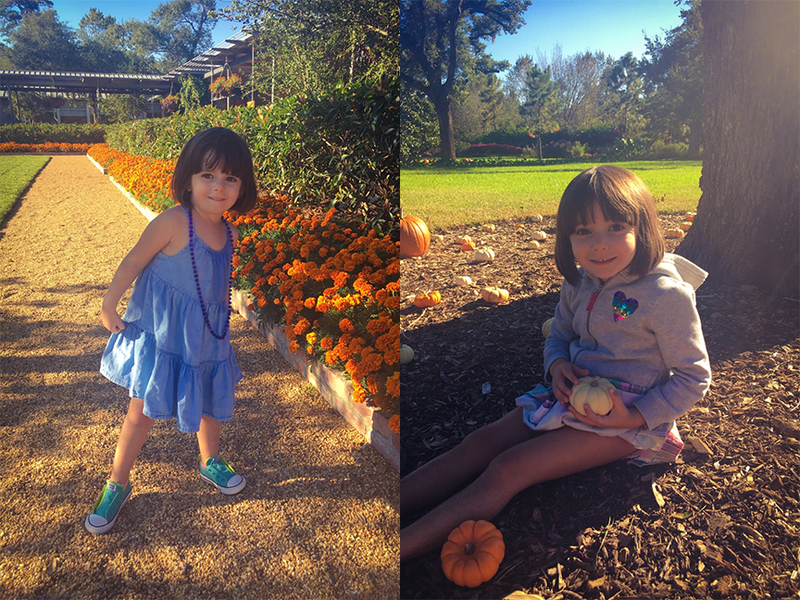 All in all, in the little bubble that we call home in Westbury (in southwest Houston), it’s been a wonderful year. The girls are growing and growing and are enjoying their Westbury Methodist Day School pre-school immensely. And Georgia is looking forward to next year in kindergarten at Parker Elementary, a music magnet school (and one of the reasons we have decided to stay in this neighborhood). Lila Jane started dance this year at Banbury Dance School (whose mistresses are straight out of central casting) and she can’t get enough of it. Both girls are healthy and happy and bubbly and so much fun to be around. The other day, I cried a little as I said goodbye to them before I left for an umpteenth trip to Italy. 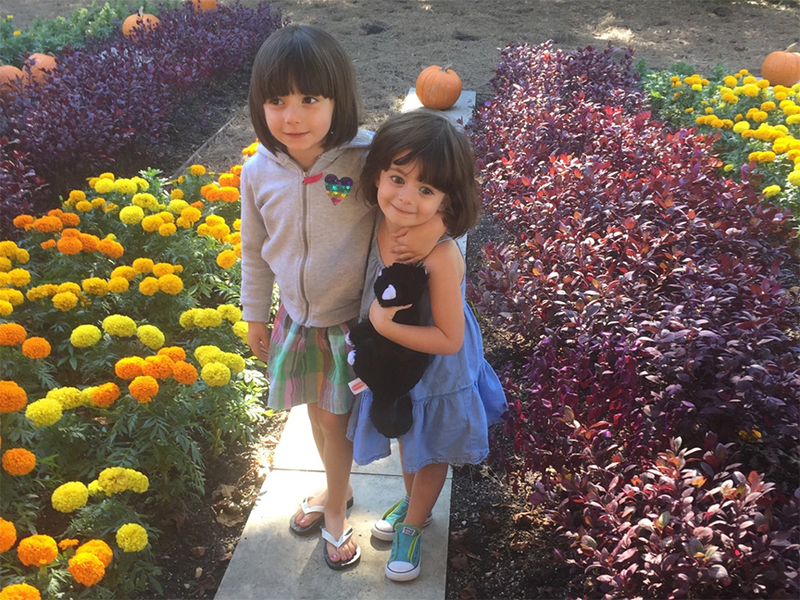 They’re both polite, sweet, and very social little girls and they really understand the importance of empathy and kindness to others. What a blessing they are to us! Tracie continues to bake and sell “character cookies” and that’s been a fun adventure for her in part because of the new community it’s opened up to our family, both here in Houston and online. She recently made cookies for a best friend’s wedding in Manhattan but hasn’t abandoned all the baptisms and birthday parties where character cookies are needed here in our corner of southeast Texas. She’s also really been enjoying her work with Rodan + Fields skincare, another network and community that’s opened up to her through her professional life. As the girls become easier to care for, I think it’s been great for her to expand her social life through work. And the extra family income ain’t hurting either! My marketing consulting business continues to thrive and I have some great new clients lined up for next year. But the thing I’m the most excited about is my new adjunct position with the University of Gastronomic Sciences in Italy, which will become an EU-accredited institution of higher education next year. I taught one seminar there this year in Italian and next year, I’ll be teaching three seminars in the Master’s in Italian Wine Culture program — all in English. It’s funny how I’ve come full circle to being a teacher again, something I love and enjoy dearly. That Ph.D. came in handy after all! I’ve handed off wine director duties at Sotto in Los Angeles to my colleague there but I will continue to consult on the wine program there as we prepare to open a new downtown restaurant called Rossoblu (part of the same restaurant group). Writing the list at Sotto was so rewarding, on so many levels. And now I’m really looking forward to writing a pan-Italian list, with a focus on sparkling wine, at the new venue. The rapidly evolving political climate in the U.S. and Europe has both Tracie and me deeply concerned about the future of tolerance and humanity- and humanitarian-focused policy in the western world. And we are also carefully watching the December political reform referendum in Italy, which will ultimately affect so many people we love and people we work with. I haven’t shied from writing about my political and ideological views on the blog. 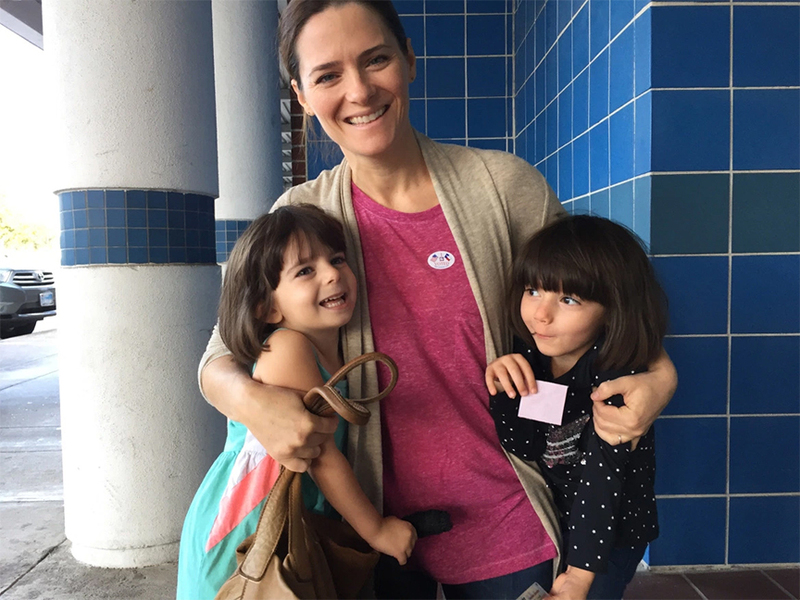 The issues at stake are too important to me — and to the future of our family — for me to remain silent. In January, discourse and posturing will become action and activism. May G-d help us all. May G-d bless us all. In the meantime, Tracie and the girls are the light and the joy that make me excited to get out of bed every morning and the images that I conjure in my mind when anxiety keeps me from sleep. I hope this letter finds you all well. Sending much love and hope from Texas. Happy Thanksgiving to all. P.S. I wasn’t able to do a wine club offering in time for Thanksgiving this year. But I’m planning one that will go out early next week. If you’re interested please let me know asap. I’ve already taken a lot of orders and the wine is going fast (even before the offer goes out). P.P.S. 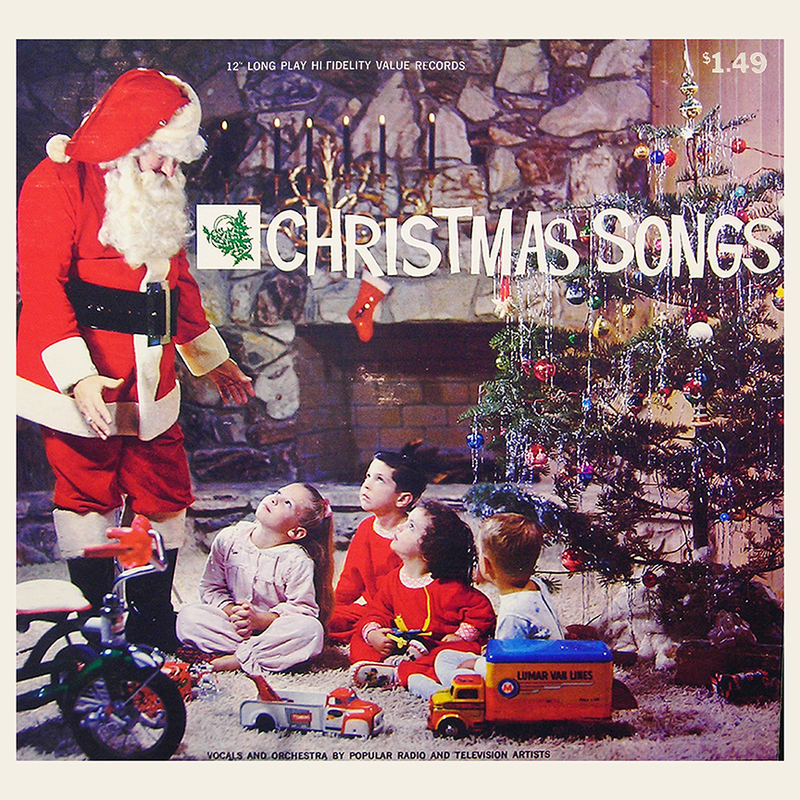 In case you missed Parzen Family Singers’ new Christmas songs, click here to hear/download them! Happy holidays! There’s a strict rule in the Parzen family home: thou shall not listen to Christmas music (even though you love it so much) until the week of Thanksgiving (and not after January 1). After all, part of what makes Christmas music so special is that you only get to hear it six weeks of the entire year. Here are two new Christmas songs from Parzen Family Singers. I hope you enjoy them. You can download them on Parzen Family Singers Bandcamp. Above: the number of Post-it notes at the Union Square subway station in Manhattan continues to grow. In another chapter of my life, I visited that subway stop nearly every day. This image and the ones that follow were sent to me by my friend and Manhattanite Ben Shapiro. Click on the images below for high-resolution versions and feel free to share them as you like. As a Jew who grew up attending a minimum of two hours of Shoah studies each week at Hebrew school until I became bar mitzvah at age 13 and as a student of European history throughout my undergraduate and graduate student career, the thought of a public registry of persons based on their religious beliefs sounds as horrific to me today as it did when President Trump first entertained the idea during his campaign many months ago. The difference is that now, in Trump America, the registry could very well be implemented. I applaud Jewish and Muslim leaders for taking a stand on the terrifying prospect that our nation could embrace such a policy. And I hope Christian leaders will do the same. Mitt Romney and Ted Cruz are devoutly religious political figures within the Republican party. It’s hard for me to imagine that a registry based on religious beliefs will align with their Christian beliefs. I trust that their belief in G-d and the teachings of Jesus Christ will trump Trump’s vision for a religious-based registry. Here in Houston, the mood is tense and people speak of the current situation — as Trump administration appointments trickle in — in hushed and restrained tones. So far my friends on the right have refrained (mostly) from deriding me for my views. (Surprisingly, the criticism of my politically inspired blogging has come mostly from the West Bank of the country.) Friends on the left seem to wait until the “coast is clear” before they speak up about their feelings. But when they do, their pain and disbelief seem to bleed from them. Above: in the wake of Trump’s win, the German magazine Der Spiegel published a cover that depicted him as a flaming asteroid heading toward earth. The title read: “the end of the world as we know it” (image via Twitter). As a white male I’m ashamed. As a Jew I’m afraid. As an American, 2018 can’t come soon enough. As an earthling, I grieve for my planet. I have a lot of admiration for Eric, as a writer and a wine expert and taster. And I also know him to be a wise and adept arbiter of the zeitgeist. His sentiment resonated with me deeply and I retweeted him. Jews aren’t white, future lampshade. Stop pretending to be white, nobody is falling for it anymore. How can you be both White and Jew? Son of a Jew = Jew. Jew = NOT White. This morning, my family and I awoke early to discover that Donald Trump has appointed his campaign manager Stephen Bannon, the executive editor of Breitbart News, as a top advisor. Bannon is a self-avowed anti-semite and a champion of the extreme right movement in our country, the alt-right, whose members regularly espouse anti-semitic, misogynist, and racist rhetoric. There is no question where Bannon stands: between his own personal affirmations and the hate-fueled ideology that very publicly drives his media outlet, his anti-semitic views are well known among political and cultural observers. He is not only one of the architects of our new president’s campaign but he is now going to be one of his top advisors in the White House. Donald Trump claims not to be an anti-semite but he clearly holds the values and ideologies of anti-semites in high esteem. He has such great admiration for Bannon that he is going to work very closely with him in shaping American policy. I am a Jew and I cannot stand for my president to allow such hatred to become part of my country’s policies. His supporters claim that Jews are not “white.” That’s okay with me. I don’t need to be white. But does that mean that my children are not white? Gauging from Bannon’s supporters’ tone, they don’t consider my children to be white since they are part Jew. That’s okay with me, too. But these attitudes are terrifying to me in the parallels that we can draw between them and the early policies of Nazi Germany. The historic similarities are uncanny. Clearly, Bannon doesn’t subscribe to Judeo-Christian values. But does he subscribe to Christian values? Is anti-semitism okay with Christians? I’ll have to ask some of my “white” friends. This is my president, people. I didn’t vote for him but he is my president. He is your president. He is our president. We cannot stand for this… The Parzen family will not stand for this. No ends justify these means. 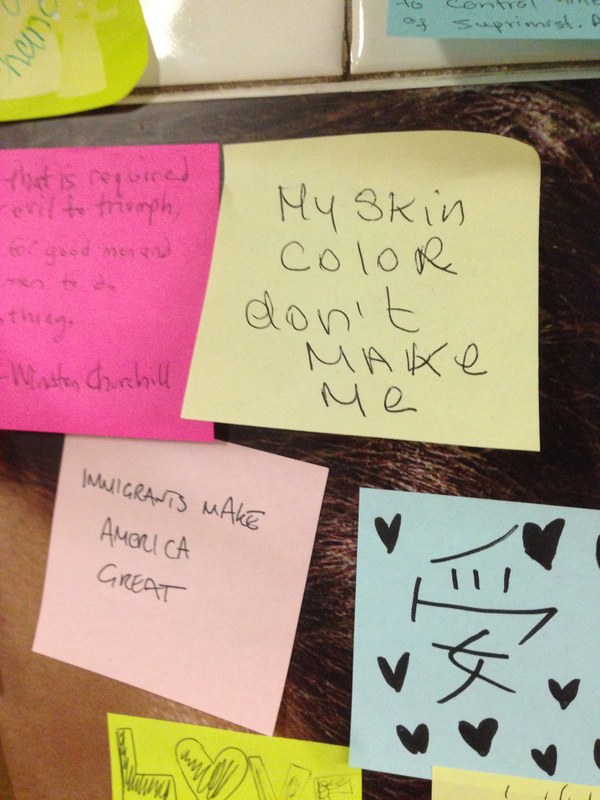 Above: people fastened Post-it notes to the walls of the subway in New York City yesterday, prayers laical and religious, uttered in disbelief (photos by via Ben Shapiro). “You’re going back to a different America than the one you left,” said one of my best friends in Italy yesterday as we continued to parse the meaning of the Trump presidency, the uncertainties it brings, and the dark future it conjures. “Our only hope is in the Republicans,” he added, noting that the party of the American Right is the only political force that can reel in our newly elected, often unpredictable, and famously temperamental president. From the 20-something students at the University of Gastronomic Sciences to my middle-aged Italian wine trade counterparts, not one person I spoke to expressed optimism this week in the wake of the election. I’ll just leave it at that. Driving to Milan from Piedmont yesterday evening, I realized that actually I’m not going back to a different America. In fact, I’m going back to the America that always was and has been: the America I had conveniently (however wrongly and unwisely) chosen to ignore and the America who elected Donald Trump and delivered him and all the baggage that comes with him to the White House. His overt misogyny, his latent and manifest bigotry, and his revolting macho swagger were no match for the hopes, desires, and dreams of the socially, culturally, and economically disenfranchised among us. In the end, their aspirations for our country trumped Trump. And so be it. So it is and so it will be. It’s their fair-and-square turn to lead us into the future. Echoing the vanquished, I believe that we owe it to them to let them lead and we owe it to them to support them in their endeavor to succeed. Congratulations, Mr. Trump, and congratulations to all those who supported him. Let me be the first to say that I am with you even though I wasn’t among you. You are my sisters and brothers and I am your countryman. Lead on and I will follow and support you, not begrudgingly but earnestly and hopefully however mindfully. Please see this op-ed published yesterday by Harry Belafonte in the New York Times. In it he quotes the great American poet Langston Hughes (1902-1967): “Let America Be America Again,” a poem written by Hughes in 1935 (published 1936). Early in the morning of the 2016 presidential election, after a restless night, I am reminded as well of these lines from the closing poem of Hughes’ collection of poetry Weary Blues (published 1926). Hopefully tomorrow America will be America again. G-d bless America. G-d bless us all. Photo taken in San Diego, California, August 2016.